When you don't have anything nice to say, don't say anything? Right, so I will not mention Holy Ghost. I will however shed a bit of shine on our 2 heroes from New York City. Justin Strauss & Teddy Stuart have started a new side-project that they've titled very appropriately a/jus/ted. While not a great deal of material is available from this new moniker, there are seemingly some impressive productions that will be forthcoming on both Southern Fried Records and Under the Shade. Giving attention to the the time and energy that both of these producers have invested into their existing solo careers, it seems as though it is almost safe to say that their future work as a/jus/ted will head in a similar direction to that of what we hear on this tidied up version of "Okay". 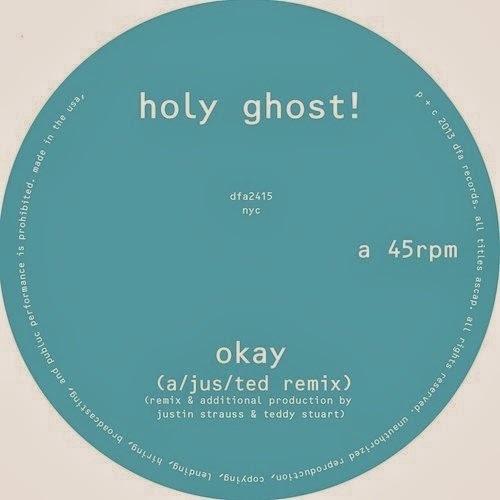 A considerably more positive hats off is well deserved by Justin and Teddy, who've together successfully rerouted what was for me, a one time partially listened to track very likely on it's way to never being heard again, and whipped it into a wickedly proper dance floor mobilizer.